I have an appointment Monday that is 0.3 miles away from Hoosier Mama, so immediately I think, what a great way to start off this appointment! Despite the fact that I will have to head right to the dentist immediately after! Then I realized Hooiser Mama's is closed on Mondays, and wondered if I could change my appointment date. Pie Lady wrote: I have an appointment Monday that is 0.3 miles away from Hoosier Mama, so immediately I think, what a great way to start off this appointment! Despite the fact that I will have to head right to the dentist immediately after! Then I realized Hooiser Mama's is closed on Mondays, and wondered if I could change my appointment date. I have sometimes had the similar regrets and strategic thoughts. Welcome to the club! A new co-worker tells you he is going to Kaplan, LA and you can tell him the best places to eat in this remote town and what is in season. You watch an episode of Seinfeld and wonder if Jerry's cutting board is by John Boos. I checked, Calumet Fisheries opens at 10:00 on Sundays. Your mission is to return with smoked fish! ...your clock reads 7:06 and you think, hey, I know that guy. When a three year old asks her father where cinnamon comes from at the grocery store and you interrupt to explain for five minutes as well as giving six stores in the nearby area that have a better variety and better quality. (And a couple of folks ask for addresses that overhear the conversation). When you get an e-mail from a former student saying "Doc, I'm going to be in D.C. for three days, where shall I eat?". exvaxman wrote: (And a couple of folks ask for addresses that overhear the conversation). At the grocery store, I overhear a woman asking where to find Pão de Queijo, or Brazilian cheese bread. Cashier didn't offer any ideas. I asked the woman to repeat what she was looking for, then advised to try Hippo Bakery at Mitsuwa in Arlington Heights. Now this lady, the cashier and the people behind me all asked for information on how to get to Mitsuwa. When you postpone laundry day until after your smoke cook. HAH! Thanks Cathy for the laugh I just got. It hasn't happened to me since I got married, but yes, food was more important according to my old employes. Pie Lady wrote: ...your clock reads 7:06 and you think, hey, I know that guy. A week prior to cinco de mayo I heard from the owner of a mexican restaurant that he would be roasting a whole lamb for cinco de mayo, so on sunday morning I made the walk just past lawrence only to find that the lamb dinner was a total bust. 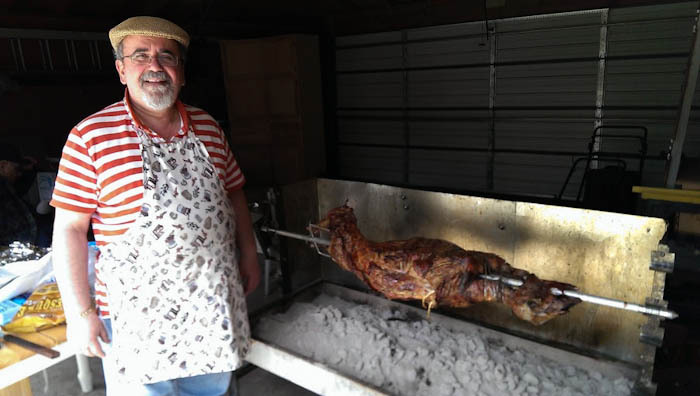 Walking home with my tail between my legs, I happen to look over and see a whole lamb spinning over coals on a rotisserie being tended to by a jolly Greek man in an apron drinking a bud light. He was all alone. I kept walking, got about a half a block past when I thought to myself how stupid it was not to at least stop and tell him how much I admired his rotisserie setup. He enthusiastically invited me in for a drink and a “taste” which started with the innards (heart, liver, intestines etc) and culminated into a full on Greek style easter dinner with his wife and her parents who were the most adorable first generation Greek immigrants. I didn’t even know that the 5th was Greek Orthodox easter so it was a big surprise to me. We ended up having a great time, sharing stories about the history of the neighborhood, cooking, brewing beer and making wine. You sit at a delightful meal with other LTH'rs & discuss for the entirety of the evening, not the food in front of you but what you've been cooking at home. That's a fantastic story! I also love his apron. I love him. An unbridled willingness to share Easter with a new friend. He's a remarkable human being. Thanks for sharing how sharing food helps foster friendships. I'm touched again by the small kindnesses abounding throughout humanity. Guess he was just eating to live. You take your kid to see the movie "Turbo," and when you realize there's a struggling little taco stand in the movie that has delicious, fresh food and just needs a little boost, you think that if only LTHForum.com existed in that world, they wouldn't need a super-powered snail to win the Indy 500 so that the place could get some publicity. nukegirl wrote: You take your kid to see the movie "Turbo," and when you realize there's a struggling little taco stand in the movie that has delicious, fresh food and just needs a little boost, you think that if only LTHForum.com existed in that world, they wouldn't need a super-powered snail to win the Indy 500 so that the place could get some publicity. Perhaps Grace Kelly was one of us? Philadelphia scrapple: a dish fit for a princess!! Word. Well, offal with polenta is pretty standard Northern Italian (albeit more associated with the other side of the country), so I'm sure she could make do when the real Philly scrapple wasn't available. ....you see that there's heavy traffic heading west on 290, and your 6-year old says, "Everyone must be going to Standard Market." A friend calls to advise he has a frozen shoulder. "Pork?" I inquire hopefully. "No, a frozen shoulder and it is painful!" "Oh," disappointed it is not pork and still wondering what is a frozen shoulder. I am now up to date on frozen shoulders. When you see a stranger wearing an obscure restaurant or food fest tee shirt and not only have you heard about the place you have actually been there. When you read the New York Times' Dining section, THE TACO ISSUE (10/2/2013) - and your main reaction is to feel sorry for the people of New York.